Thanks for joining in with our launch and blog hop. we hope you enjoyed the fun. Our Christmas Eve words were Santa's Coming! We have all now Generated our Candy winners and they are as follows!! Congratulations Carol! Can you please contact us with your address. Vicky is poorly at the moment, so we will announce her winner when she is better. Congratulations to all the winners (make sure you contact the DT member directly with your address) and don't forget to play along with the A challenge ... we have a fab prize up for grabs. ...that ABC CHALLENGE has a new sister blog! We have organised a Christmas Eve Blog Hop. Below are the sneak peeks of all the Christmas projects that the DT has made for you to see. We also have a small task for you...each DT member has a letter for you to collect, to fill in the spaces in our Christmas Eve words. Be sure to leave comments on the project that they have been busy making to help inspire you, to be in with chances of winning their great prizes... some of the DT gang have Mr Linky set up and others a comment system...either way you have 7 chances of winning a brilliant prize! 1. Post about our new challenge blog and the blog hop on your own blog, with a link back here, you might wanna become a follower too so you don't miss out. 3.Visit all of the DT the blogs in order to collect the 7 letters that you will need to fill in the gaps in our mystery words, to create 2 words about Christmas Eve. Don't forget to leave a comment on each of the DT posts, to be in with a chance of winning their candy too! Our blog hop will remain open until midnight on the 29th December. 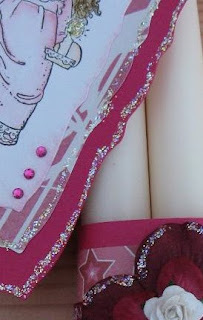 The winners will be posted here, and on each DT blog after the Blog Hop closes. Apologies...we seem to have upset Mr Linky...so please add a link to your blog in the comments if you wish to enter our blog hop. Not long now to wait! We are very busy and getting excited about our Christmas Eve Blog Hop! Don't forget to tell all your crafting buddies! to come along and join in the fun! Hop starts here tomorrow at 8am!! for an exciting Christmas Eve Blog Hop! and tell everyone about the Hop! to see what you can do to join in the fun! Firstly say thank you to the other DT girls for thinking my crazy idea was more cunning than crazy! The Idea of this new ABC blog is so exciting just the thought of being ahead next Christmas alone is a happy thought! Stamping and crafting is a passion we all share so I wanted to combine the love of Christmas and crafting. It's been so pleasing to see all your Christmas creations I so hope that you carry on creating all year with us! We invite you to take up this challenge and to try out techniques for your Christmas projects you would normally not have a chance to try, or just create some cards to get ahead for next year. We will be opening the first challenge on the 30th December a little early so you can get into the swing of the Challenges before you pack all your Christmas goodies away, Some weeks we will add a little extra requirement to the challenge to keep you on your toes... The extra challenge will be if you choose to accept it and not compulsory! ie something added extra to your card or a sketch or even a technique. The first challenge will run until the 12th of January so you will have plenty of time to play! and the DT will have lots of time to create some fab inspiring projects too! Soooooo if this sounds like fun to you then please Follow us so you don't miss out on some great challenges and prizes and maybe if you really wanna help get us going you could post about us on your blog.